04/03/26:Added new option to display a polar/rose plot based on the particle orientations (v. 1b). Added option to include solidity and convexity values. Changes to the dialog box. 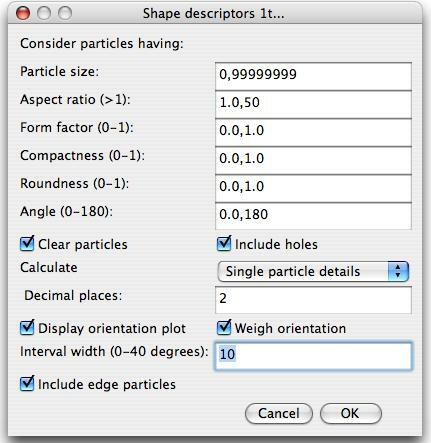 06/02/25 Option to include/exclude holes in particles. 090721 Included the Feret diameter. Changes to the dialog box. Outlines are given by default. Convexity is temporarily deactivated (v.1t). 090722 Verifies if the images use an inverted LUT (V. 1u). Download Shape_Descriptor1u.class to the plugins folder and restart ImageJ. Syverud, K., Chinga, G., Johnssen, P.O., Leirset, I. and Wiik, K.: “Analysis of lint particles from full-scale printing trials". Appita J. 60(4): 286-290 (2007). Particles may be removed depending on the particle shape. Note that small particles (approx. 1-5 pixels) may give form factors larger than 1 and may not be considered in the analysis. 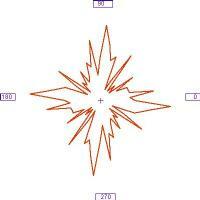 Check Display particle polar plot to generate a polar/rose plot based on the single particle orientations. The generated plot may also be weighed by using the single particle areas, i.e. for a given orientation large particles will have a major significance than small particles. The particle orientations are grouped in classes. The width of each class/interval may be determined in the Polar plot interval width. Small values yield a more detailed plot. The plugin requires binary images.